What is on your Christmas dinner menu? Have you started planning it yet? Whether you have ham or turkey or something else altogether, every dinner is made better by serving a crescent roll with it. 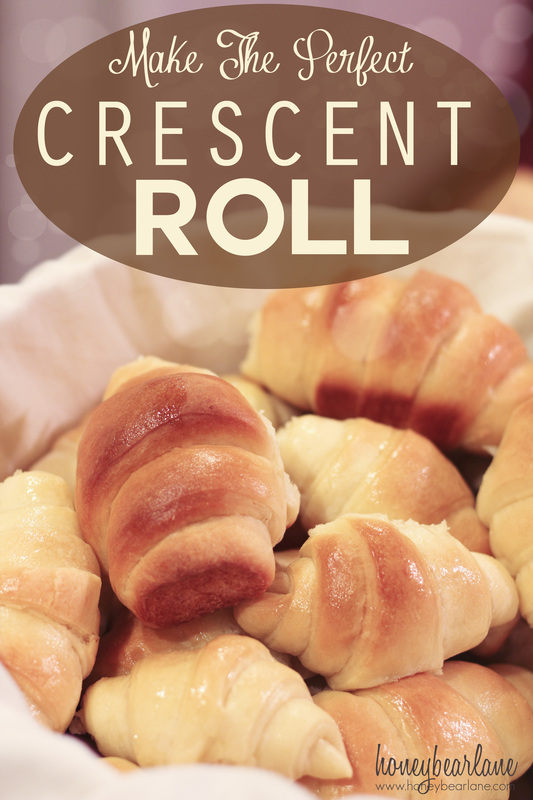 I really want to share my grandma’s crescent roll recipe because it is my personal favorite. But I’m worried that my relatives will come after me with torch and pitchfork in hand ready to write me out of the will for sharing the secret family recipe. So this year for a Thanksgiving party I attended I was assigned to make rolls and I wanted to try out my husband’s great-grandma’s crescent roll recipe. It’s his all-time favorite (so maybe it’s just a matter of what we grow up with.) So I made them and they were a) easy to do, b) tasted great, and c) hard to mess up. All things to make a great and timeless recipe. And bonus! My Mother-in-law said that I could share the recipe on my blog so you all can benefit. Don’t worry if your circle is a little misshaped. This doesn’t matter, it just means some rolls will be a little bigger than others. 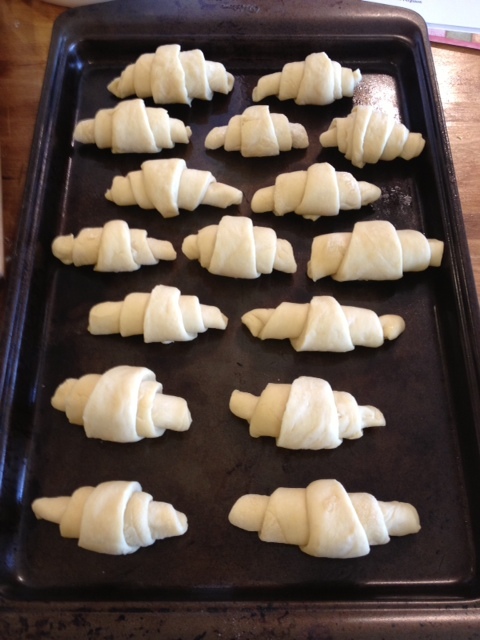 To roll into a crescent shape: Start at the fat end and roll up to the point. Tuck the point on the bottom when placing it on the cookie sheet. With the yeast–make sure the water is WARM (not hot not cold) and give it time to activate. If you don’t activate the yeast properly the whole thing will be a disaster. 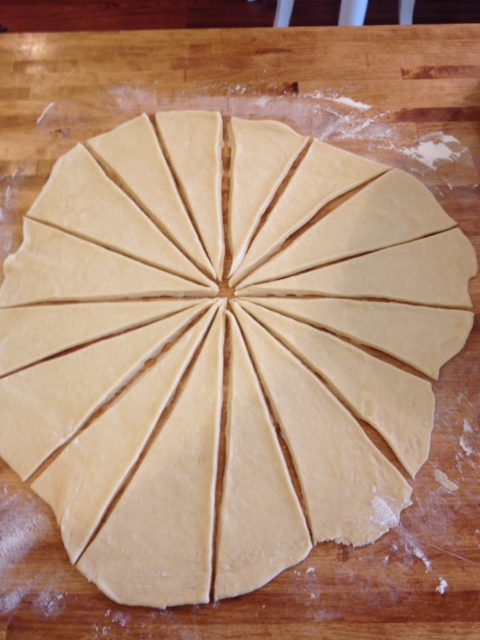 Also make sure that you put some flour on the counter before rolling out your dough because otherwise your little triangles will stick to the board and you’ll have to start over. If you are running short on rise time, turn on the oven and put your tray on top or keep them in a warming drawer. The heat helps them rise faster. Do you have any tips to share? Leave them in the comments! What do you make for Christmas dinner? I don’t see how this is different from Gramma’s recipe. I mean, water/milk. Pretty much it. And there is no shame in spreading the gospel of rolls!! Or was this just a test, to see if anyone reads your blog? I’m with Holly. Grandma herself shared her recipe freely – the more the merrier, in her mind! In fact, I wouldn’t even be surprised if your grandmother-in-law got her recipe from some variation of our grandma’s recipe, because it spread far and wide in the 60’s. I’ve been wanting to try rolls! You read my mind. If I wanted do some of the steps the night before, do I just let them rise overnight? Does it matter if they rise longer than the times specified in the directions? Just make sure they stay covered and you can leave it on the counter to rise. YEAH!!! I make bread and basic rolls all of the time, similar to this. 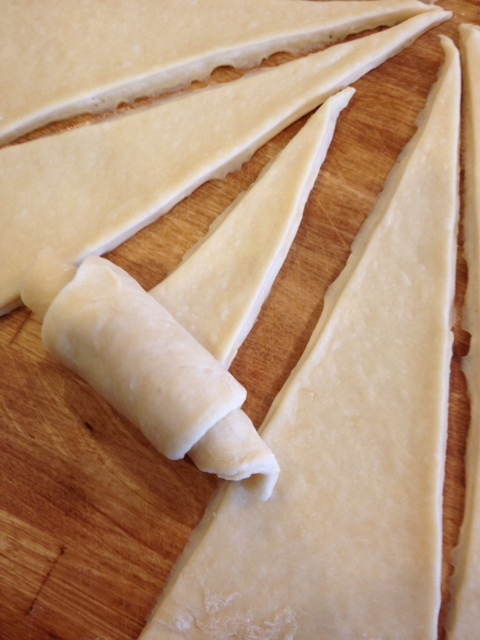 I don’t know why it never occurred to me to roll the out and cut triangles. I love crescents on top of pot pies and with soup. Thank you a million times over!! It’s nice to share, I’m sure your Grandma taught you that. I am woundering if at some point these can be froze? (Not after they are baked because I would like to use the dough for hotdishes and such). And if so would u take them out of freezer. Let them rise in their crescent form,unroll and put on top of hotdish or whatever I’d be making? I’m not sure about freezing them in their dough form but you could always try it like Rhodes rolls!